Below are stories from the past week, mainly concerning Israel. 3. In major policy shift, India may end support for “Palestine” at U.N.
Jordanian Preacher Yassin Al-Ajlouni has said that a place of worship should be set up for Jews on the Temple Mount. The Temple Mount is Judaism’s holiest spot, which the newer religion of Islam has sought to appropriate, and Islamic leaders have tried to prevent Jews from praying there in recent decades. In a statement posted on the Internet on December 18, 2014, Al-Ajlouni said that the Jews should be given a place of worship on the Temple Mount. He said: “I have given a lot of thought into what I am about to say, because I know that it is the most important issue of our times, and that whoever talks about it is likely to face severe criticism, and will be accused of generating controversy and maybe even strife. Do the Israelites have the right to pray in Beit Al-Maqdis? Is it permissible to allocate a place of worship in Beit Al-Maqdis for the Israelites? “… The place where Omar Ibn Al-Khattab prayed was named the Al-Aqsa Mosque, but the truth is that the Al-Aqsa Mosque is not the Mosque of Omar, but the entire area within the old walls, which is called Beit Al-Maqdis. I call upon the Islamic world and upon the Hashemite sovereign to allocate for the peaceful among the Jewish Israelites a house of prayer within Beit Al-Maqdis. “Beit Al-Maqdis is the place sanctified by Abraham, Isaac, Jacob, and Joseph, as well as by Jesus son of Mary and by the Muslims. There should be a special place of worship for the Jews among the Israelites under Hashemite and Palestinian sovereignty, and in agreement with the Israeli regime… Part of the courtyard, where there are trees, will be allocated for the prayer of the Israelites. Video here (courtesy of Memri). Tom Gross adds: Were such a move to occur, this would be a significant step in making Israeli-Palestinian peace more likely. Israeli media reported yesterday that China is poised to complete its acquisition of Tnuva, Israel’s multi billion-dollar dairy conglomerate. The purchaser is China’s Bright Foods. While European and North American opponents of Israel continue to call for the boycott of the Jewish state, other world powers, in particular China and India continue to significantly increase investment there. IN MAJOR POLICY SHIFT, INDIA MAY END SUPPORT FOR “PALESTINE” AT U.N.
India has growing defense, diplomatic and economic ties with Israel, as I have noted in several recent dispatches on this list. An emergency response team sent by the Israeli-government and privately supported agency IsraAID has been a key player in providing medical, psychological, social and material relief goods in the areas close to the Philippines city of Dolores, where a massive typhoon struck earlier this month. Local Philippino UN staff singled out Israel for praised for its efforts. Israel has delivered food and non-food items to thousands of Philippinos, including rice, noodles, water, mosquito repellent, and hygiene kits and set up welfare centers for children. During the Holocaust, the Philippines accepted Jewish refugees when few other countries did, and Israel and the Philippines retain close humanitarian and other ties. In a meeting on Saturday evening with U.S. Senator Lindsey Graham (who is visiting Israel), Israeli Prime Minister Benjamin Netanyahu, condemned chief Palestinian negotiator, Saeb Erekat, for his inflammatory comparison last week between Israel and ISIS. Former New York Times writer Chris Hedges (who as I have noted before regularly slams Israel), is also coming under criticism after he compared ISIS with Israel. In a rare move, the New York Times accurately described an incident involving Israel in a headline last week. Many would regard the headlines by Reuters, Al Jazeera and others as very misleading. So is that by BBC Arabic service, whose headline (in Arabic) was “Palestinian shot dead by Israeli army near Khan Younis”. Hamas proudly took credit for the sniper attack, not that you would know this from certain media headlines. * In a separate incident, a photo of Palestinian dressed in a Father Christmas costume throwing tear gas at Israeli security forces in Jerusalem, has gone viral. Here is one report from the (London) Daily Mail. Every Christmas, some (Muslim) Palestinians dress up this way and provoke IDF troops, in an effort to get media-friendly photos taken of them being “harassed” or “man-handled” by Israeli soldiers. 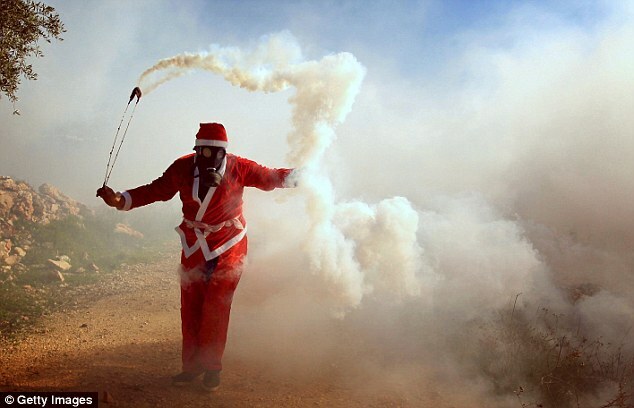 The resulting photos make Israel appear to be attacking innocent Christmas revelers. However, this year this policy backfired as some media outlets showed a Palestinian “Santa” on the attack. A Palestinian baby collapsed on Saturday after suffering what turned out to be a heart attack while crossing the border between the West Bank and Jordan. A nearby Israeli border official called IDF paramedics who raced to the scene and then called in a helicopter. The baby was taken by helicopter to Jerusalem’s Hadassah hospital, where his life was saved. Last week (on December 22), Joseph’s tomb, one of the holiest places in the Jewish Tradition, was vandalized by Palestinians. To date, almost none of the international organizations, governments and media that rush to condemn Israel for any infringement they can find, have condemned this desecration. Joseph’s tomb, like many of Judaism’s holiest sites, is located in what the international community now call the West Bank, but which many Israelis refer to by its previous (pre-1948) names Judea and Samaria. WikiLeaks last week exposed an internal CIA manual, dated September 2011, titled “CIA Assessment on Surviving Secondary Screening at Airports While Maintaining Cover”. It is an open secret that the CIA spies heavily on Israel, as well as on other allies of America. The document gives American operatives using false identities specific instructions on how to handle additional “secondary screening” while entering Israel through Ben-Gurion Airport without blowing their cover. The leaked document also reveals how the CIA operates in the EU’s Schengen area, in which travelers between 22 EU countries are not required to show passports. The CIA expressed concerns that a new EU security system will potentially make life harder for American agents. WikiLeaks founder Julian Assange said the documents show the CIA is intent on carrying out spying in Europe, and confirms Israel is a target for U.S. spy operations. The new Hollywood blockbuster “Exodus: Gods and Kings” has been banned in Egypt for showing that the Pyramids were built by Jewish slaves. Morocco has also banned the film saying that prophets (in this case, Moses) are not supposed to be depicted in films. The film “Noah,” which was released earlier in 2014, was also banned in some Muslim countries for portraying Noah as a prophet.